Today I was in the Tshwane archives, looking up Devantiers. I ordered file WLD 1184/74, the divorce of Carol Lynne Devantier and Peter Dudley Devantier, and the Box was marked Illiquid Cases 1974 1183/1194, so the second file in the box should have been the one I was looking for. But instead it turned out to be the divorce of Roland Eric de la Harpe and Wendy Lynne de la Harpe. Its number was 1284/74, and it had obviously been misfiled in the wrong box. Well, that happens. People do sometimes put thing is the wrong boxes, and of course if anyone had looked for that file, they would never have found it. The serendipity is that Roland Eric de la Harpe and Wendy Lynn Boyle happen to be related to us, so we might well have been the ones looking for that file. So I made notes from it — details of the marriage and divorce dates etc., (some of the information we had was wrong). Then I wondered what to do with the file. I shouldn’t put it back in the wrong box. If I took it to someone at the counter it would probably require long explanations. Eventually I thought the simplest thing to do would be simply to order the file. When the box came, I just put it back in its right place and handed it back again. Last year we had a couple of e-mails from Devantier cousins — Deborah Devantier in the USA, and Vanessa Devantier in Brazil, asking about family connections. We couldn’t find any links in our family records, so I passed them on to Torben Devantie in Denmark, who has now confirmed the links, and that both Deborah and Vanessa are cousins. We’ll have to enter them into our program to work out whether they are 4th, 5th or 6th coursins, and how many times removed! 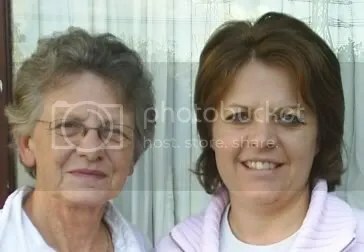 Our link to the Devantier family comes on the Falkenberg side: Val’s great great grandmother was Jessie Falkenberg, nee Schultz, who came to the Cape Colony with the German settlers in 1858, at the age of 9. And Jessie Schultz’s great great grandmother was Judith Devantier. Torben Devantie is the one who has collected most of the Devantier family tree, which is enormous. The family were Huguenots who migrated from France via the Rhineland to Brandenburg in Prussia after the revocation of the Edict of Nantes in 1685. Many other Huguenot families settled in the Ueckermark region of Brandenburg (north-east of Berlin), and they all intermarried and married French for several generations. Many were tobacco planters, and one group, including some Devantiers, moved to Denmarkat the request of the King of Denmark to grow tobacco, and for a long time the town of Fredericia was “Huguenot City”. Anyway, Torben Devantier wrote to say that he had found the link to Deborah Devantier’s ancestor Carl Wilhelm Friedrich Devantier, which is on his web site. We checked our records, and we found none of the links there, not one, not two, not three generations back. And then found that Abraham Devantier (1692-1761) who married Sarah Feut and had 11 children, which we do have, had remarried to Judith Talman, and had another six kids, whom we didn’t have. No wonder the Devantier family is so enormous. So we’ve got several generations catching up to do. That Abraham Devantier, by the way, was our Judith Devantier’s eldest brother, which means he was Val’s 7th great grand uncle. And then Vanessa Devantier’s ancestor was Friedrich Albert Devantier, and we found a tentative link in our tree, and now Torben Devantie has confirmed the link, which is also on his web site. 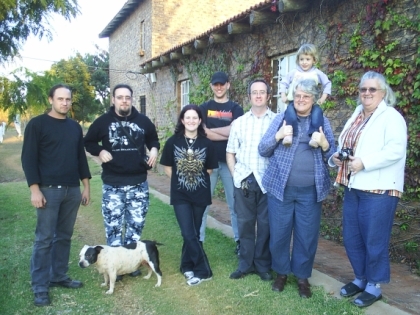 There is more about the Devantier family on our family wiki page. Last Saturday I went to the Founders Day Service at my old school, St Stithians College. I’ve put the details and some photos on my Khanya blog, for anyone interested. I went to St Stithians when the school started in 1953, and did matric in 1958, so this is the 50th anniversary of my matric year, and I wondered if I’d see any old classmates there, but there were none. I know of some other family members who went to St Stithians, and perhaps there are others who went there that I don’t know about. If any of them see this, perhaps they could leave a comment about their time there. Simoné and Brenda Hundermark visited us today. Simoné is my (Steve’s) second cousin — her grandfather Simeon Growdon (1876-1942) was my grandfather George Growdon’s (1873-1948) younger brother. The Growdon brothers came to South Africa from Cornwall in the 1870s with their parents William Matthew Growdon (1851-1913) and Elizabeth Greenaway (1842-1927). William Matthew Growdon worked for the Cape Government Railways, first as a platelayer, and later as a permanent way inspector. Most of the sons worked for the railways as well. Simeon went back to the UK and married Louise Quaintance in Wales, but she died soon after the birth of their only child, Alice. He then returned to the Cape and married Sarah Jane (Rose) Gibson, and had three more children, Willie, Simeon and Thelma. Simeon Junior was Simoné’s father. Simoné and her husband live in Cape Town, so I had not met them before, and so it was good to see her and her daughter Brenda when they came to visit this afternoon. Brenda is keen on sport, and had come to Pretoria to play badminton. i’ve been in KZN for a few days. I went to Durban for a conference, and took the opportunity to visit some family members. I saw Arthur and Dorothy Benjamin in Northdene. Dorothy is Val’s cousin on the Greene side, and their son Todd was there with his wife Pamela, preparing to emigrate to Australia, and daughter Jessica. Arthur has been bitten by the family history bug, and is trying to trace the Benjamin family that goes back to St Helena. 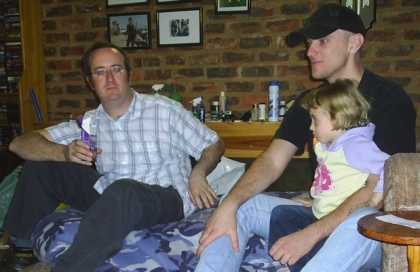 I’m typing this in my cousin Jenny Aitchison’s house in Pietermaritzburg. Jenny is overseas at the moment, but her husband John was a university friend, so we’ve been catching up after not seeing each other fro several years. I’m alos typing this on John’s computer, which has a strange keyboard and Windows Vista, which seems to do strange things to the text, so I’ll write more when I get home.